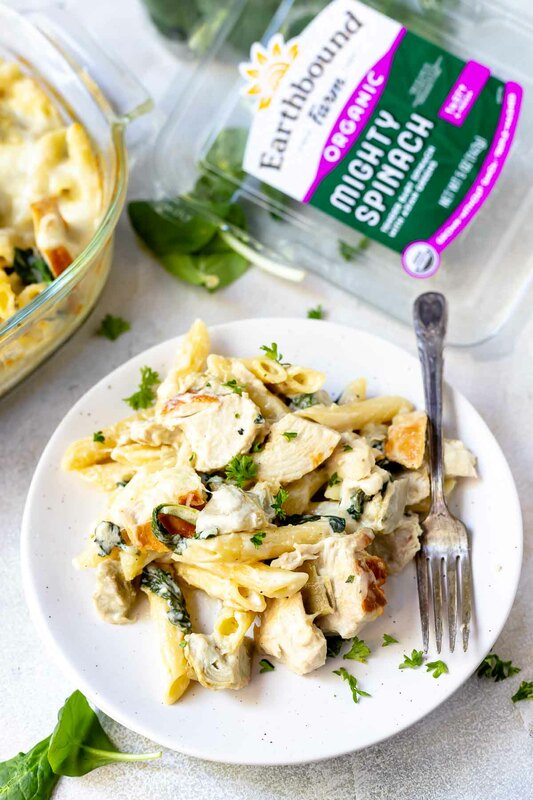 This Spinach Artichoke Chicken Alfredo Baked Ziti Recipe makes a wonderful dinner and is easier to make than you think! 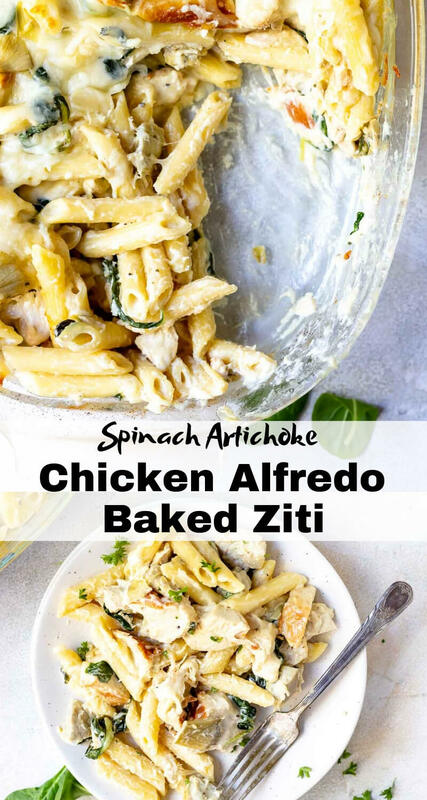 An easy homemade alfredo sauce tossed with chicken, spinach, artichokes and pasta then baked to perfection. I am proud to be partnering with Earthbound Farm to bring you this recipe. Aren’t all of us MOMS just trying to keep everything together and make the best choices for our families? There are so many decisions to make throughout the day. We have to pick our battles with the kids, keep the house running, play chauffeur, clean, earn a living and cook a nutritious dinner! And we are expected to look good while doing it. I don’t know about you but I fail miserably most days. There is actually a term for this… decision fatigue. With a constant barrage of decisions (big and small) our brains get overloaded. It’s just too much. 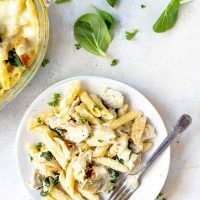 That is why I keep my dinner recipes quick, easy and nutritious like this Spinach Artichoke Chicken Alfredo Baked Ziti Recipe. It almost takes longer to say than it takes to make 😆 Ending a hectic day with a comforting meal that the kids will eat without a battle is a good decision. Earthbound Farm is helping to make the right decisions even easier. Not only is their organic produce nutritious, tasty and affordable, it is also good for the environment. By making the decision to buy organic, not only are we choosing to keep our family healthier, we are choosing to keep our planet healthier too. It’s little changes like this that add up to big change. 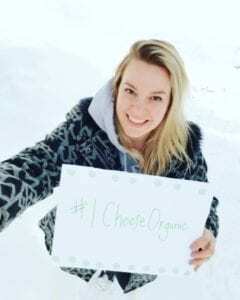 From Feb 4-17, Earthbound Farm is asking you to share your reasons for choosing organic on Instagram. To enter for a chance to win Earthbound swag including cookbooks, a canvas tote bag, or a nifty sticker, post a photo on Insta and in the caption, tell us why you choose organic. Make sure to tag @earthboundfarm and include the hashtags #ichooseorganic and #sweepstakes in your post! Step 1: Prepare chicken breast and pasta. Set aside. Step 2: Prepare alfredo sauce. Add in artichokes and spinach. 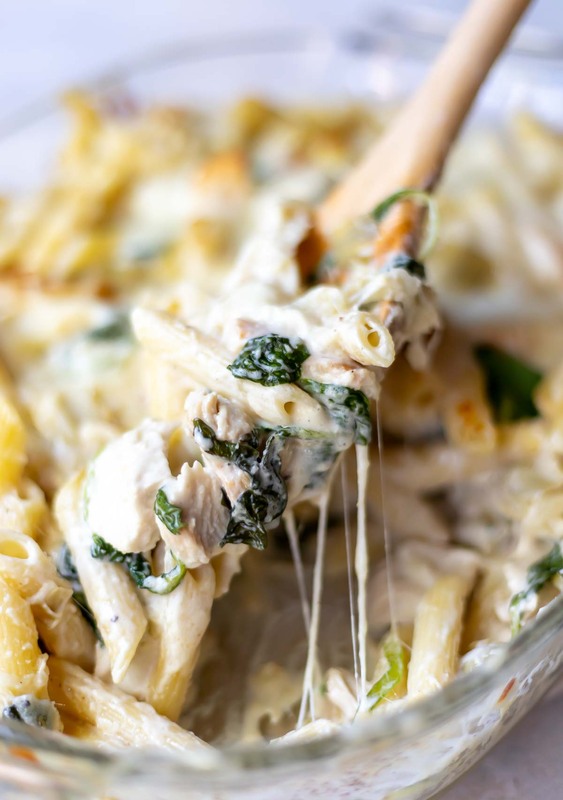 Toss pasta, sauce and chicken together. Step 3: Transfer to casserole dish, top with cheese and bake. 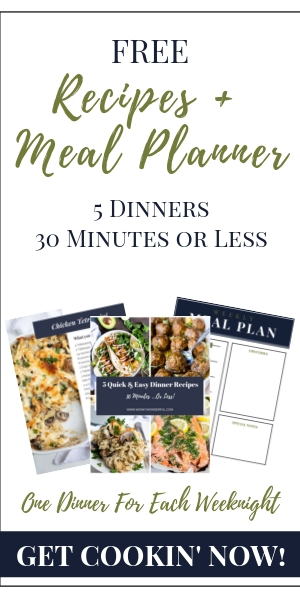 Subscribe to Earthbound Farm’s emails to receive $3 off any Earthbound Farm product and bring your day into organic balance with simple, flavorful recipes, cooking tips and coupons. Sign up here! Pan fry chicken breasts in oil until internal temp reaches 165ºF. Chop or shred and set aside. In large saute pan over medium/high heat, melt butter. Whisk in cream cheese then add heavy cream. Whisk in garlic powder, salt and pepper. Lightly simmer for 10-15 minutes to thicken, stir frequently. 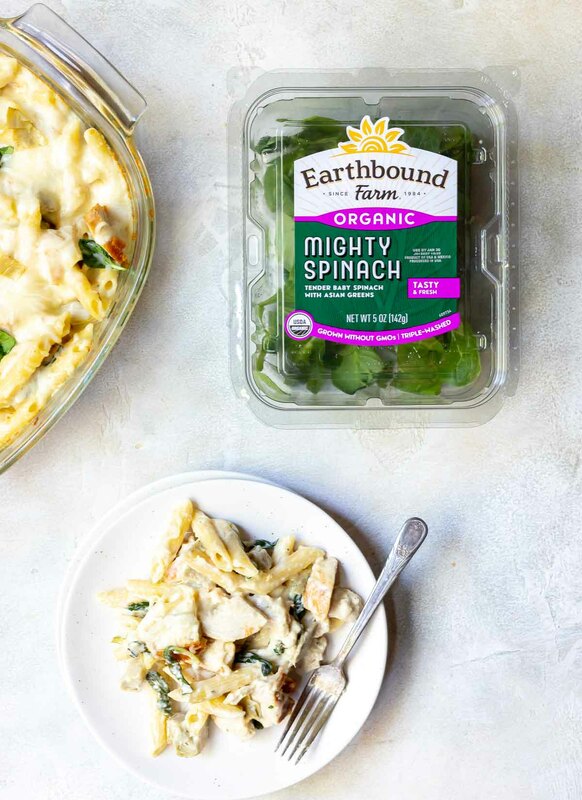 Stir in parmesan cheese, artichoke hearts, spinach and lemon. Pour sauce over prepared pasta and toss. Add in chicken and toss until fully coated with sauce. Transfer mixture to a large casserole dish. Top casserole with mozzarella. 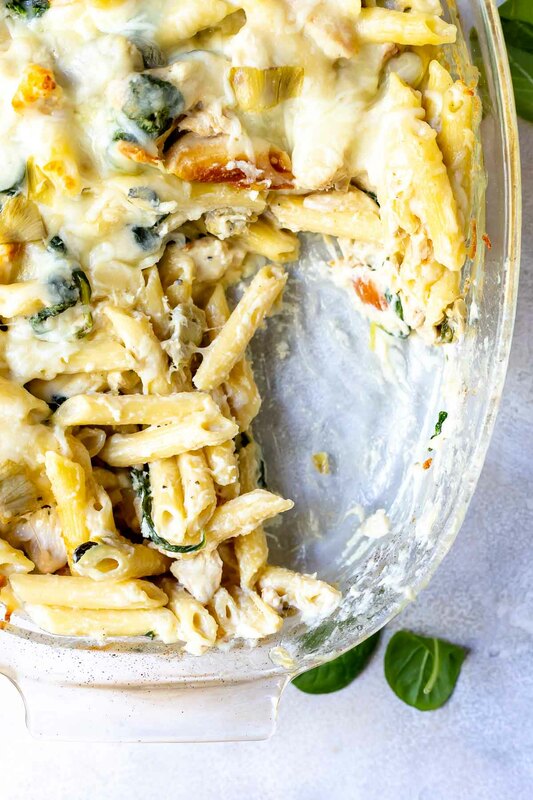 Bake 10-15 minutes or until cheese is melted and bubbly. Looks deiicious! 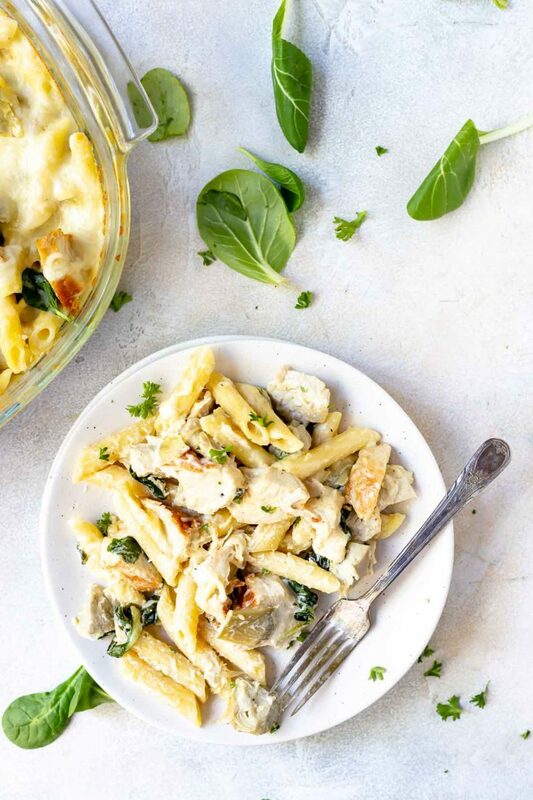 Mazzio’s Pizza has had (I’m not finding it on their menu anymore) a Spinach Artichoke Chicken Pasta that I’ve always wanted to recreate and this looks it hits the nail on the head! I’ll be trying it soon, thank you for posting!